Carrie Lennard is an SEN music teacher at St Ann’s School in Ealing and creator of The Improvise Approach, an innovative educational tool to support music making with SEN children. Below she shares her thoughts on technology, the challenges facing music practitioners in SEN and creating change in the curriculum. Can you tell us about the work you do with EQUALS? EQUALS has been around for 23 years, and is committed to improving the lives of children and young people with learning difficulties and disabilities. The organisation’s mission is to promote, share and reflect best practice in learning and teaching through collaborative working with practitioners and professionals at a national, regional and local level. At the centre of the work is a commitment to supporting the work of teachers of pupils with profound, multiple and severe learning difficulties. In this time EQUALS has built up a strong record in supporting teachers, who are teaching pupils working within the full range of the P-Scales and the early levels of the National Curriculum. EQUALS is run by teachers, for teachers. Through the network, we’re able to hear about the issues impacting children in schools. In turn we raise these with the government and other SEN related organisations to advocate for change. We also respond to the challenges that schools face with focused seminars, workshops and teaching materials designed to enhance teacher practices in the classroom. Part of the work you do is around reforming school curriculums on a semi-formal basis – why is this necessary? People are connecting and sharing ideas faster than ever and technology is developing and expanding at a similarly rapid rate. Our understanding and expectations of what is possible are changing along this continuum. However, the same problem prevails: there are still not enough trained music teachers in special education. I’m a special needs music teacher and I’m passionate about music in education. Other than the actual teaching, nothing makes me happier than meeting others in my field and sharing our ideas and experiences. I had this opportunity at the EQUALS conference in May 2017. Teachers working in the creative arts came together to discuss, dissect and rewrite the current EQUALS curriculum documents (music, drama, art and dance) in order to better support today’s special needs teaching staff, with an emphasis on creativity. What changes have you made to music education for children with learning disabilities? Over the last six years, I’ve developed a new music resource that is designed to enable young people with learning disabilities to be more musically creative and independent. 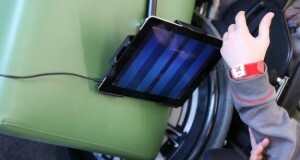 It comes in the form of an eBook and utilises the excellent accessibility of the iPad and the ThumbJam app. It’s called The Improvise Approach. The resource has a number of aims. The first is to give people with special needs a tactile and dynamic experience of playing a musical instrument, both as a soloist and in a group. It’s about building an inclusive approach to music making. The second thing is about making sure that every child is genuinely making music. This approach makes music making feel easy, so that even random playing can produce musical sounds that fit with specially-composed backing music. Finally – this work is not just about the children – it’s about the adults in their lives too, and equipping them with the skills to support the musical development of children with special needs. Through a training-resource eBook, we help parents and teachers to access this approach that can be shared for group music-making alongside other music technologies and selected percussion instruments. It’s a cost effective solution to inclusive music-making both at school and in the home. How does The Improvise Approach work? The eBook (available from the iBook store) shows you how to set your iPad up with the ThumbJam app so you and your music group can play tunefully, supported by the ten specially-composed music tracks. The music tracks are included in the eBook with one track and picture per page. You can project the eBook page onto an external screen for everyone to share (with a connecting lead, Apple TV box and airplay). There is also a ‘music only’ album – ‘Improvise One’ – downloadable from iTunes. How did The Improvise Approach evolve? I’d been using my improvising ideas for many years with tuned percussion, voice and Soundbeam but when iPads came along, the whole thing really took off. With a touch screen and the brilliant ThumbJam app, the students, regardless of their abilities, were now able to play a musical instrument. And given that the ThumbJam app can be set up easily in whatever scale and key you desire, it was possible to develop an approach for people who have seriously restricted movement so they could start making music for themselves. This allowed for them to be independently creative and to maximise the accessibility potential of the iPad. An important thing happened. Once the students were comfortably set up with their iPad in their best playing position, they became completely independent of staff holding their hand or having to physically support them. It was a case of stand back and actively observe – allowing the players all the time and space they needed to explore and discover things for themselves. The only way people can build the necessary neural pathways and independent skills is to enable them to do it for themselves and by themselves. Our job is to provide them with the tools and know-how.